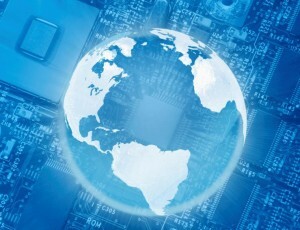 The digital transformation is here. There will be over 2 billion smartphones on the planet next year. Every minute, 72 hours of videos are uploaded to YouTube. Over 1.5 trillion Euros of e-commerce will flow through a browser this year. Taken alone, each of these is just a data point, but put them together and you can see the digital transformation taking place across all businesses. This is the same for Schneider Electric as our customers, partners, investors and products have all “gone digital”. New Designed Experience – As our company grows and evolves so does our brand. We wanted our new website to reflect the same reliability, efficiency and connectivity of the solutions we offer our customers. We feel the new approach to colors, imagery, and our new industry-specific content across the website does just that. You’re now able to experience this new design in the presentation of our solutions across segments, systems, and services, and for all of our products down to the range view. Mobile ready – Our customers are mobile; on job sites, in buildings, at the plant, in the data center, and they need a website that works on their smartphone and tablet. This new release does just that and is optimized to the specific screen size of our customers. From a 2 inch screen on your phone to a 20 inch monitor in your office, this website is designed for you. New Search Capability – Search, search, search, when our customers need to find something on our website they prefer to SEARCH for it. With this in mind we’ve relaunched the search tool; both the design, usability and functionality. We believe this new approach is easier to use and provides better results to the content our customers are looking for. More support options – We’ve redesigned the support experience for you across the site. There is a new Support landing page, outlining all the options you have to get answers to your questions. We have a new “Contact Bar” on every page of the new website, providing you real time options to call, email, or find a partner to support you. To make it even easier for our customers to register on the site, we’ve also enabled social sign-in so you can use your Facebook, LinkedIn, or Twitter login credentials with our contact forms. New navigation – Across the 100s of solutions and 1000s of products we offer, it’s now easier than ever before to navigate our entire website. You’ll find a brand new menu at the top of every page providing the most important links organized across our Products, Solutions, Services and Support options. In addition, we’ve also redesigned a new footer for the website providing an additional set of quick links to information customers are interested in. 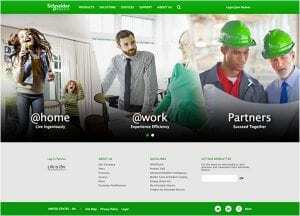 New Retail Overview – Now it’s easy to discover the numerous products Schneider Electric has available for our residential consumers. This new section of our website called @Home, provides a holistic overview of our residential offering in addition to helpful information and content for customers thinking about their next renovation project. We hope you enjoy working with our new website and want to thank all our customers and partners for their comments and input to get us to this point. However, the journey doesn’t stop here and we’d like you to continue helping us identify the next set of improvements we will make to the web experience. If you have a quick thought to share, feel free to put a comment below or feel free to use our official web survey available here. Our digital transformation is only just beginning and we look forward to continuing the innovations with customers and partners just like you. Thanks for being with us on the journey! Yes, your new website looks better. You changed the green that could barely be read over a white background and the website feels at least a little more agile. I have not have a change to navigate it all nor on mobile version yet. That said, what I was looking for, I could not find. There is no easy way to find what the requirements are or who to contact to become a distributor. It was not easy, but less difficult before.